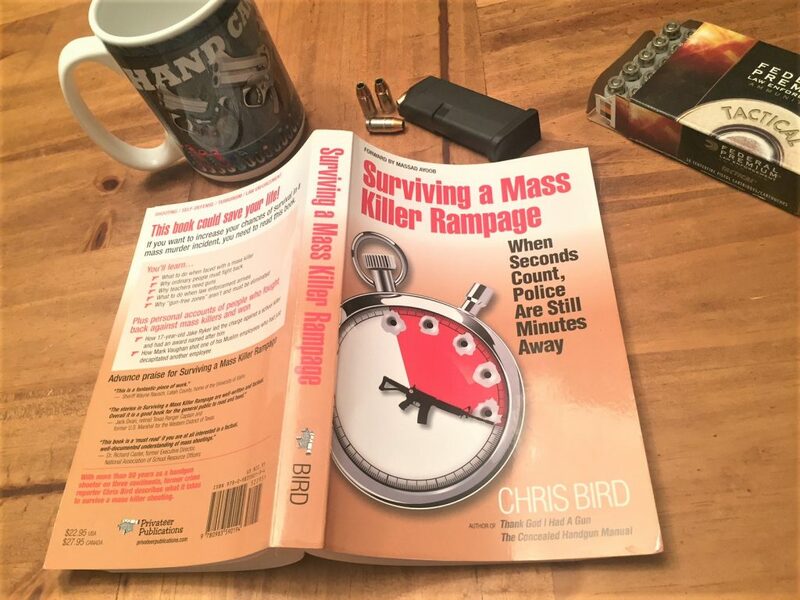 This book is a must-read for concealed carriers at any level of experience. Native Briton, naturalized American, and former law enforcement officer Chris Bird has compiled a book that deserves more attention than it gets. Surviving a Mass Killer Rampage was released in 2016. Reading it for the first time, I realized that this is as much a history book as a preparedness one. It documents prominent American mass murders and attempts. It starts with the takeover of the University of Texas at Austin’s bell tower by a sniper in 1966, through the neutralization of Islamic terrorists in Garland, Texas in 2015. These accounts make up more than half the book, so I find the title, which leads me to expect a DIY violence survival manual, a bit misleading, albeit true to Bird’s intent. Never mind the slightly off-track title. On the first reading, I was astonished at the level of detail Bird includes. This is a well-researched book, but it’s not dry and academic. Instead, the event histories are riveting, thanks to Bird’s talent at presenting the details of his own interviews with people directly involved in the incidents, as well as forgotten or obscure police reports. True and sometimes gruesome stories are enriched with details never heard on the news even when these events occurred. Interviews add depth; as the respondents share gems of wisdom that can only be gained in combat. Of course, most of the respondents are American police officers often working in their own hometowns. But others are civilians who got their feet moving to rescue others when the need arose. For example, the book tells the story of Pastor Terry Howell, of Living Water Fellowship Church, becoming the target of attempted murder by a church employee who was caught stealing. (Already, incidentally, you know more about this incident than local papers would report). The employee drew and fired a legally concealed handgun at Howell’s head when both men were in Howell’s office, along with the pastor’s wife and daughter. That first bullet, a .45 ACP, narrowly missed Howell, but the muzzle flash was close enough to cause his head to bleed. Howell’s daughter leaped into action, pushing the shooter’s arm aside just in time for a second round to also miss. Howell credits his daughter with a life-saving move, but the fight was far from over. A wrestling match with the armed man ensued. Howell, from the floor, drew and fired three rounds from his own Springfield XDs, chambered in 9mm, striking the employee in the chest and side, and missing once. The janitor ran outside and then into another part of the church as the family jumped into a passenger van outside that belonged to a construction worker who was working on site. They convinced him to speed away as they called 911. 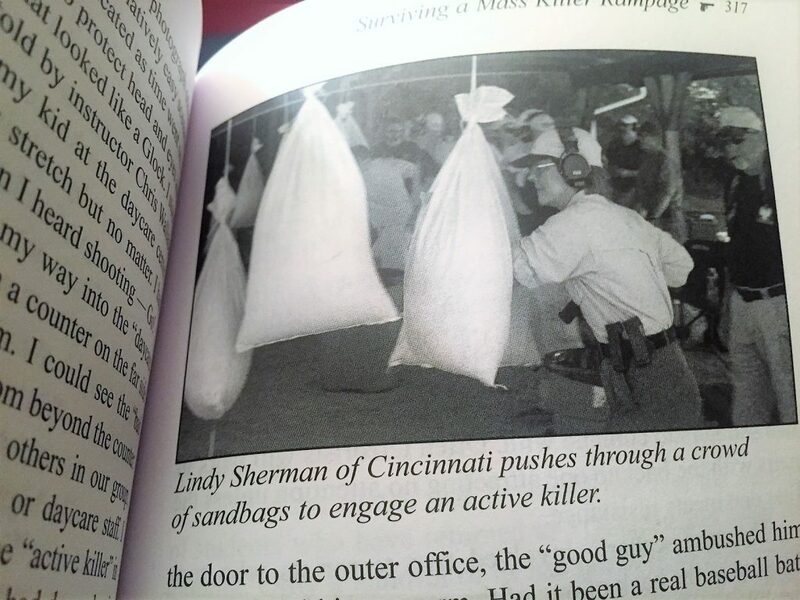 Detailed training reports are accompanied by photos of people like Lindy Sherman engaged in drills. Howell’s description of the event is a classic description of what happens in a fight for life—only being cognizant of having fired two shots, of the employee looking like a shape and not a person as he registered his sights on target, the ensuing cascade of thoughts as he rushed downstairs to attempt to lock down the school portion of the building and inform staff of impending danger, and never mentally registering the large quantity of blood in the janitor’s path until after the incident. The janitor finally collapsed and expired just inside the church’s main entrance. The informed armed citizen can read this story, and others like it, for more than its real-life, action-packed excitement. The Living Water Fellowship incident holds many reminders, including the importance of having a readily accessible firearm on one’s person and not outside in the car as is the habit of too many people. It’s a reminder that getting one’s feet moving as soon as the need is apparent, like the daughter did, is critical to save your own or another’s life. And like many other shootings, it’s proof that the best, center-mass hit, even through the heart, is not the end of the fight when an attacker is determined. That 12 seconds, on average, that it takes for a solid shot to cause enough blood loss to stop a serious attack may as well be an eternity. The importance of practical training, with an emphasis on scenario training, is emphasized throughout. Bird uses many examples and quotes from live training events he’s participated in. He describes programs embraced by several school districts to train and arm teachers, and goes into detail describing the FASTER and ALICE programs which have grown in use since the book was written. Speaking of training, the book makes it obvious that malfunctioning and suddenly empty firearms, in the hands of both the criminal and the good actor, have affected the outcome of many an attack. Training to instinctively, efficiently clear a malfunction and perform a reload is something I practice regularly and encourage students to do as well. Stories in this book make it obvious why. Imagine being in the position of Fort Hood city police Sergeant Kimberly Munley, who responded to a single-shooter, Islamic terror attack at the Army base. She had already sustained multiple gunshot wounds when her pistol malfunctioned, just as the terrorist closed in on and stood over her, his own FN Five-Seven suddenly, and miraculously, jammed, allowing Munley to escape her would-be murderer. This comment is not to cast blame to a problem that can easily happen in a hot situation, however it is productive to think of typical causes of malfunctions, insufficient support from the wrist being most common in the dependable handguns most police agencies choose, and training to clear a malfunction with an injured hand, on the floor. What a useful training exercise when done safely! Another officer in the same incident, Sergeant Mark Todd, whose rounds are credited with finally ending the killing spree, are testament to the value of good training. In a news interview cited in the book, he recalls hearing the voice of his agency firearms instructor telling him to take his time and make each shot count. 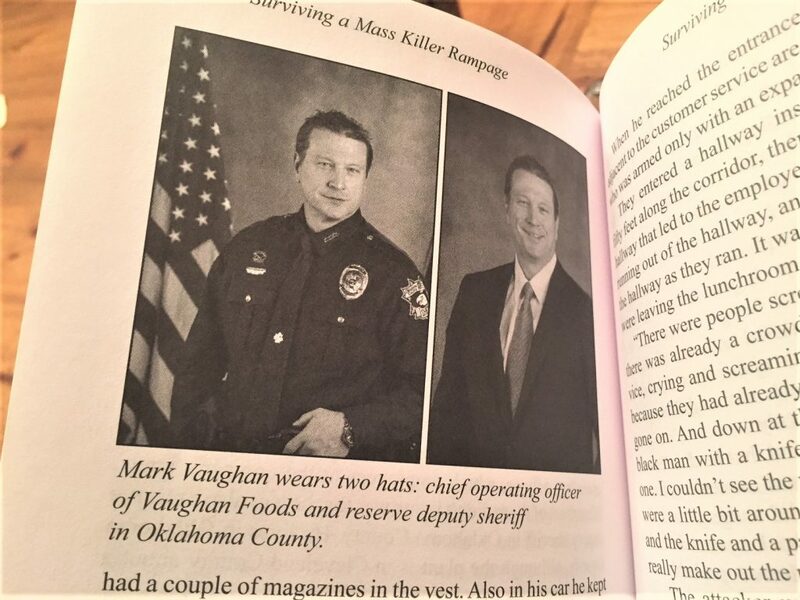 Did you know Mark Vaughan, Oklahoma businessman and reserve deputy, stopped a knife massacre at work with his AR-15? Practical training and related stories aren’t all this book covers. Bird contacted experts on psychology and gun policy to develop this book’s rich content. From an array of experienced and academic voices, the reader is admonished of the dangers of learning passivity at a cultural level, and of the veritable invitations to kill–otherwise known as gun-free zones. It’s clear from a phone conversation and the spirit of his writing that Bird, a UK native, cherishes the endangered American birthright of self-determination when it comes to going armed and being able to take a clear stance against those who would commit violence as well as their creeds. He has felt, more than most Americans, the sting of increased violence in his home country that’s grown as a result of overly tolerant policies. Along with promoting ongoing training, he promotes violence prevention and intervention planning based on priorities of personal and community safety rather than social justice. In a world of media that sees guns and the people who own them lawfully vilified, especially by “outsider” voices like Piers Morgan, it would be refreshing to see this lawful immigrant grab the mic (or camera, or keyboard) and offer some well-documented contrast. This seriously underrated collection of true stories and training techniques is available starting at $10.99 on Kindle, and $21.92 for a paperback. Goodreads has a list of quotes from the book that makes its philosophy, if not the historical content, obvious.